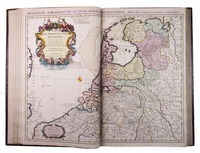 Amsterdam, Johannes Covens & Cornelis Mortier, [ca. 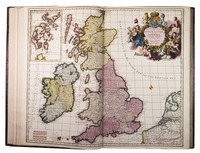 1725]. 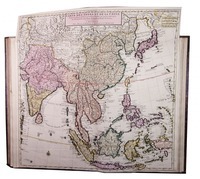 Imperial folio (53 x 35.5 cm). 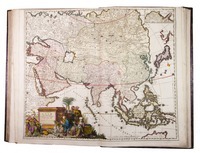 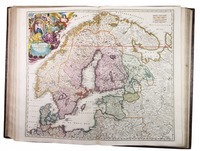 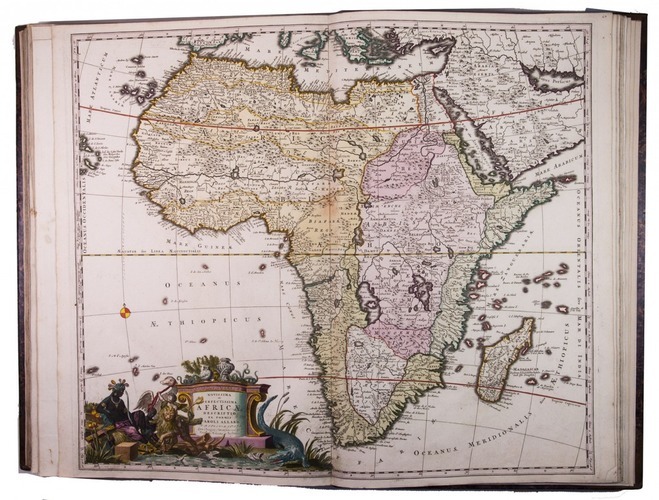 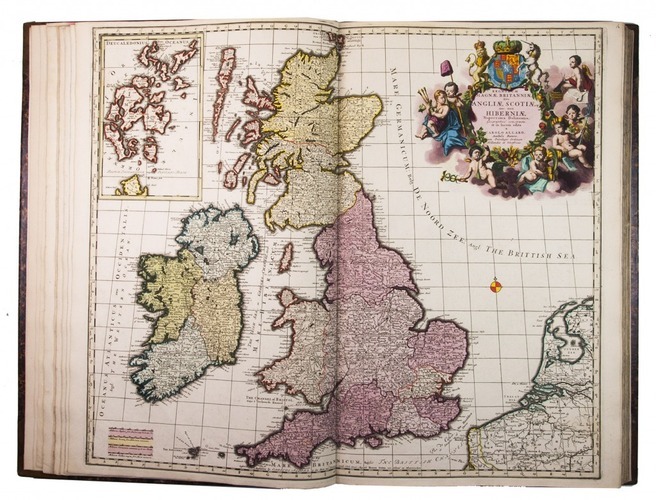 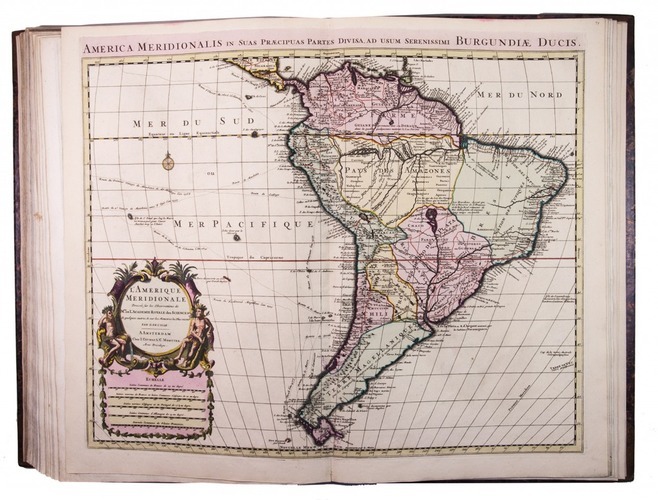 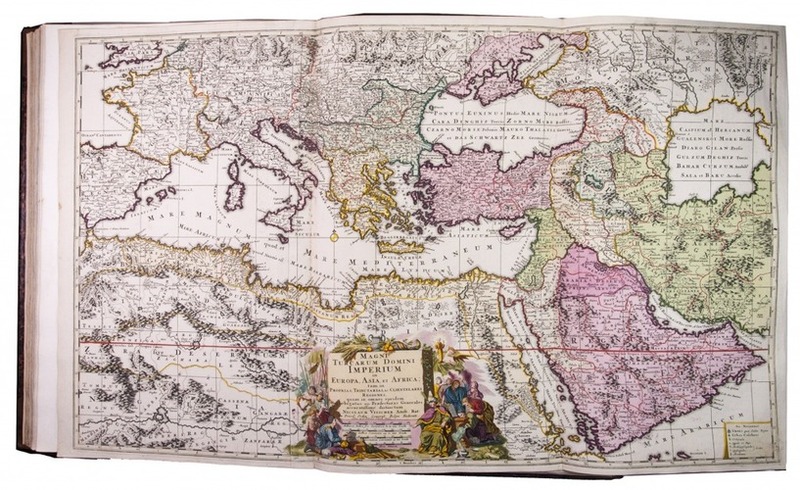 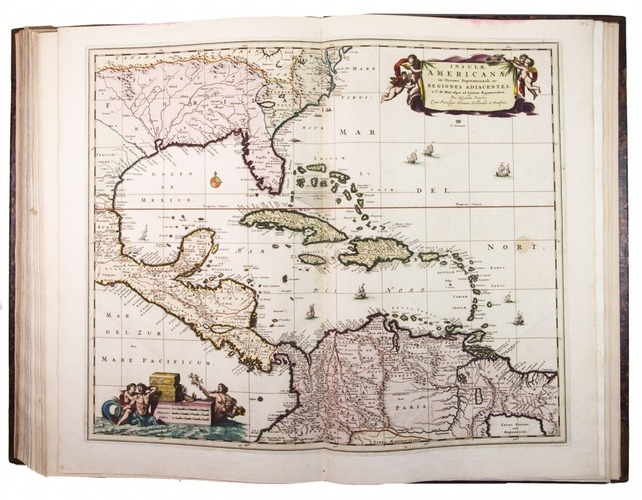 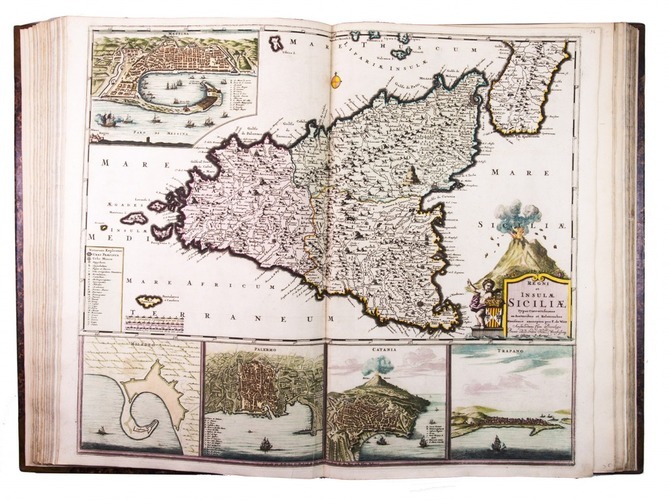 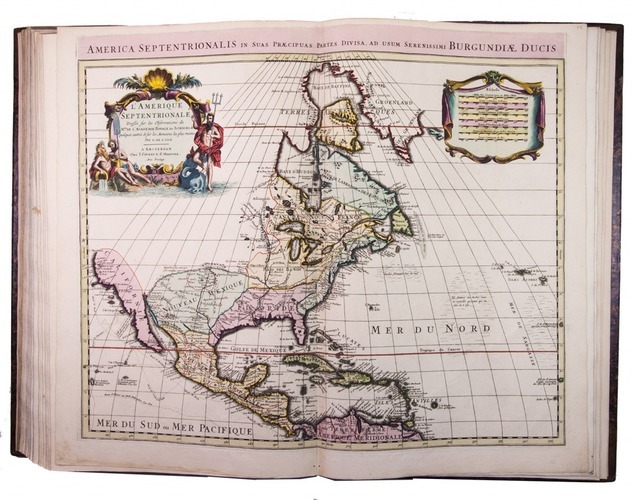 With engraved title-page and 76 double page (or in 8 cases larger folding) engraved maps, the title-page and all maps and their decorations coloured by a contemporary hand. 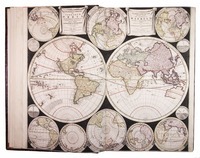 Half tanned sheepskin (ca. 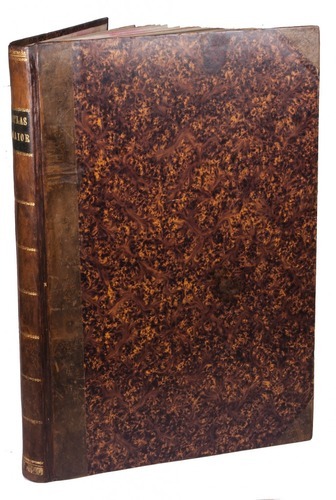 1900), gold-tooled spine. 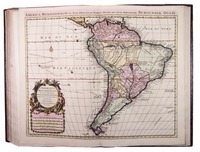 Extremely rare Covens & Mortier edition of De Wit's Atlas maior, first published by Frederick de Wit ca. 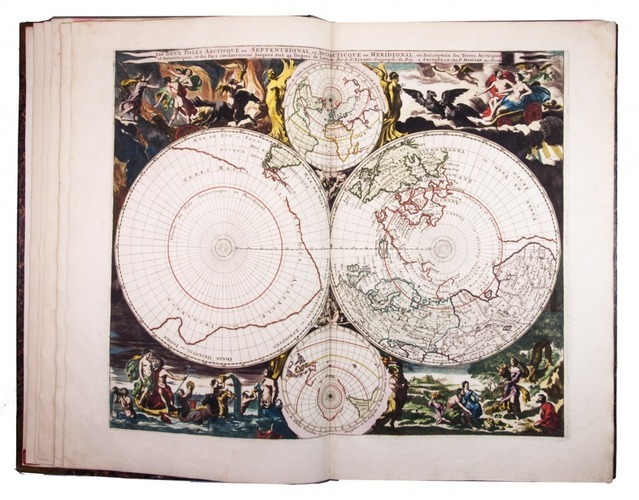 1688, but continued by Pierre Mortier from 1708 (when he bought De Wit's plates) and by Covens & Mortier from 1721, here with the engraved allegorical title-page and all 76 maps and their decorations beautifully coloured by a contemporary hand. 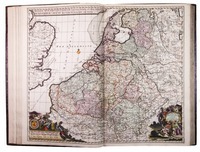 It combines maps originally issued by Frederick de Wit, with ones from Nicolaes Visscher II and others. 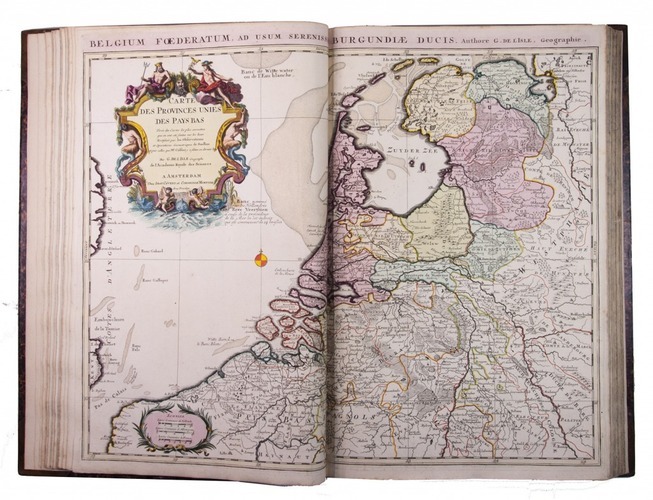 De Wit and Visscher were the leading map and atlas publishers in the Netherlands after a fire crippled the Blaeu firm in 1672. 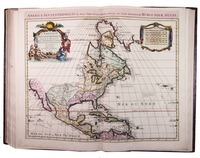 De Wit is known especially for the beautiful pictorial decorations on his maps. 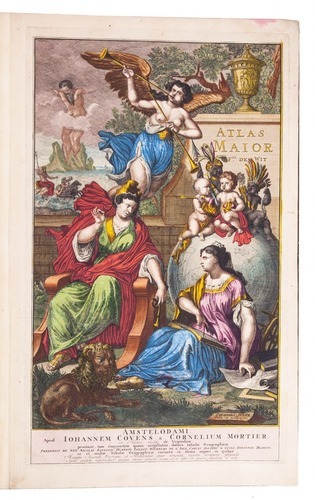 Only one other copy is recorded in the literature, at the Depôt de Marine in Paris. 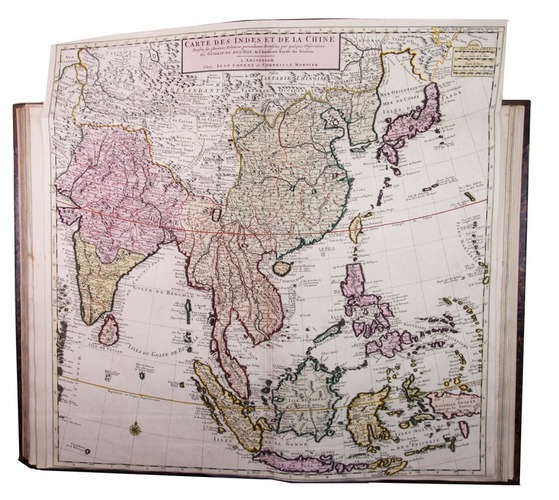 "Although the copies must have been numerous, very few are left." 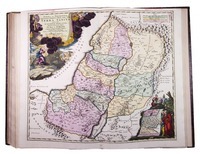 (Koeman). 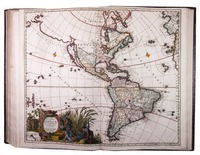 The atlas opens with Carel Allard's ca. 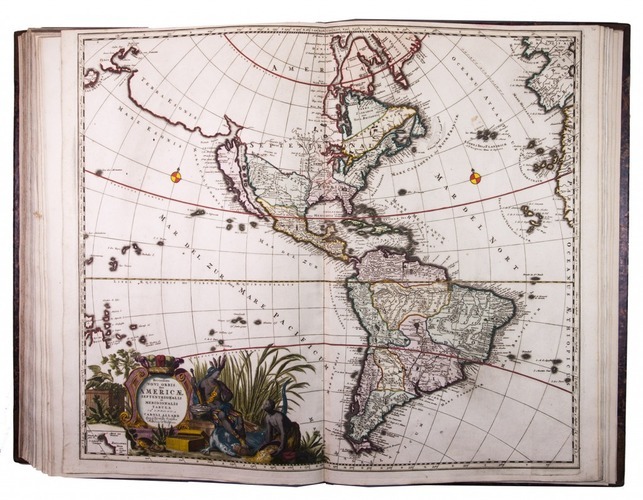 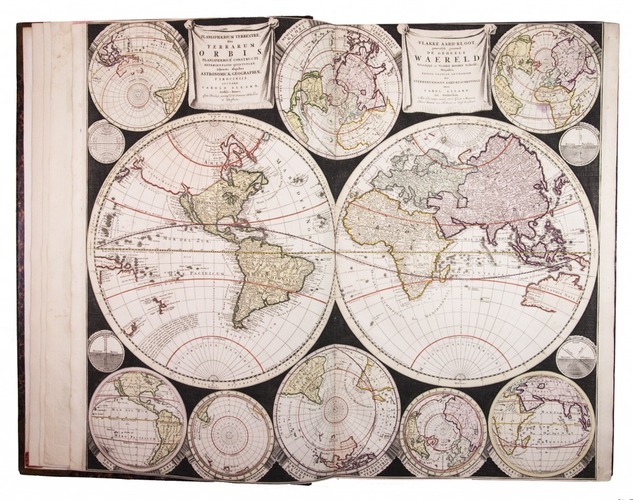 1696 world map in 2 hemispheres. 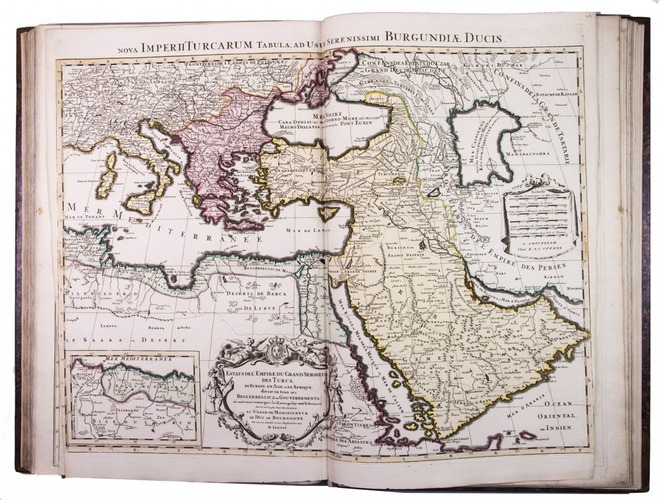 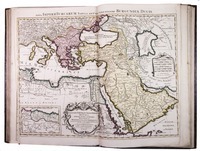 Among the other maps are 6 of the continents; Nicholas Sanson's map of the poles; 2 maps nominally of the Ottoman Empire but including besides the entire Arabian peninsula, also most of Iran and either the entire Mediterranean Sea (Visscher) or its eastern part (Jaillot); Homann's map of Iran; De l'Isle's map of India, Southeast Asia and the East Indies (folding); Visscher's map of the West Indies; De Wit's maps of Malta and of Corsica & Sardinia. 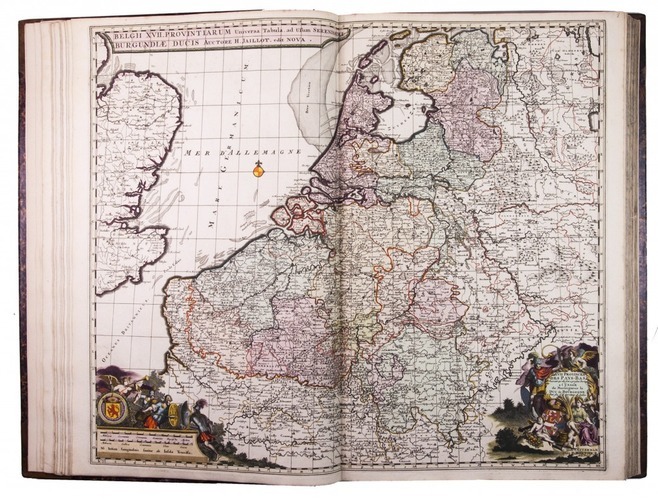 Within Europe the atlas gives special emphasis to the Low Countries, with 19 maps. 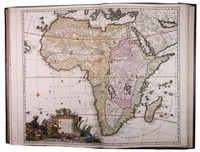 With a long tear along the fold repaired in 2 double-page maps and small tears where two folds cross in 1 larger folding map, but otherwise in very good condition and with large margins, with only an occasional small tear at the head or foot of the fold, one or two maps with an unintended fold and one with a small hole. 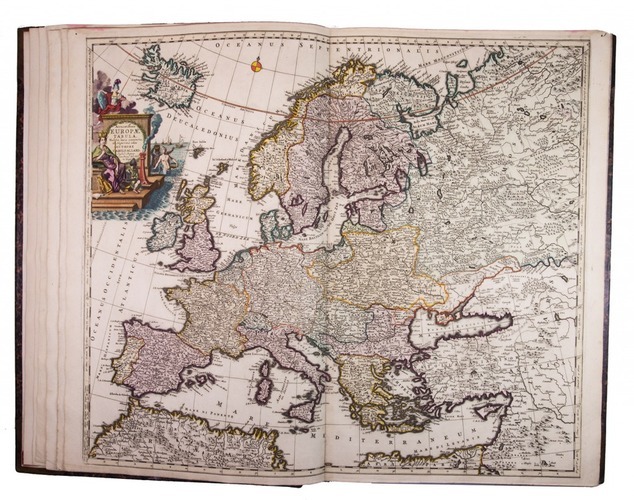 Two maps are slightly smaller than the others and have therefore had some of their margins extended. 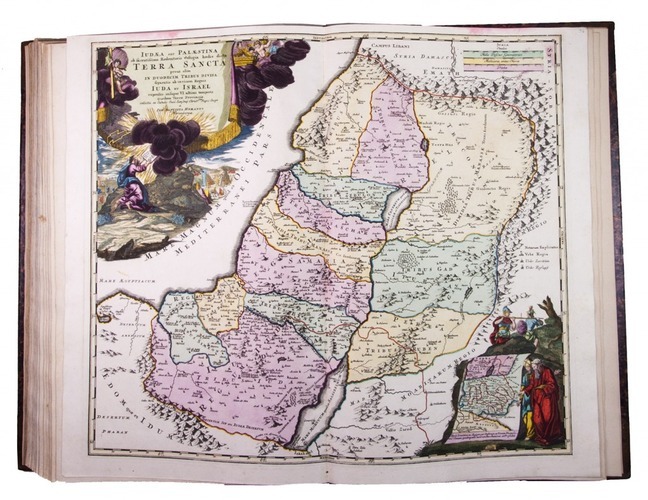 A splendid hand-coloured great atlas, with only one other copy recorded. 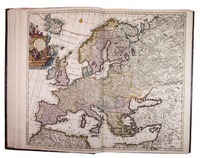 Koeman, C & M 2 (1 copy, with 100 maps), cf. 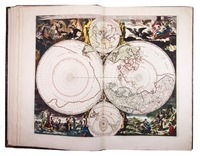 C & M 1 (based on 18th-century catalogues); V. Egmond, Covens & Mortier (2005), III.2 (pp. 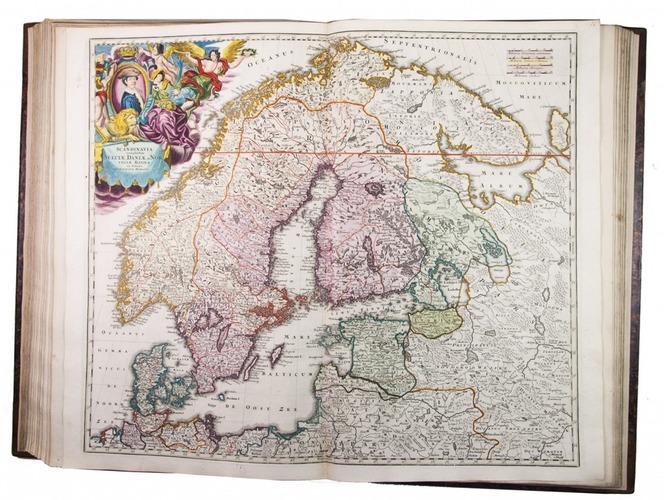 143-145, citing Covens & Mortier's ca. 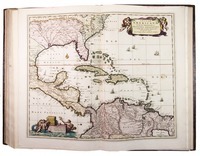 1721 catalogue).